What a month! November is going into the history books as my best month so far to date. +$16,076 after commissions. I am very excited about this months achievement. It has been quite a ride. I have seen some crazy action with the shippers craze and experienced my first OTC trade on FNMA. Needless to say I have learned a lot this month. 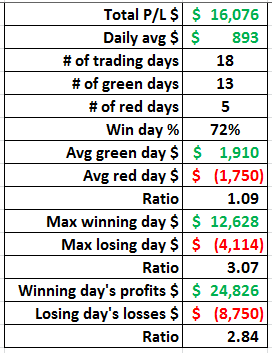 I had a win rate of 72%, a daily average profit of $893 (my personal best), and an average green day of $1910–another personal best. I had my best single profit day this month as well. Overall, it was a great month. One thing I feel I did well this month is keeping my emotions in check. My biggest profit day came as a result of emotions kept in check and a level head. I also feel I did better at staying patient on adds into parabolic shorts. Despite my big win this month, I recognize that I still have things I need to work on. I am still struggling with my two goals from last month: “1) Eliminate stubbornness on taking losses! 2) Eliminate trying to force profits. I need to listen to the price action and NOT make decisions based on my P&L. These are my week links and I will work on them until they are eradicated!” These two goals will still be my main focus for December. I have written them down and taped them to my monitors. I want them to stair me in the face all month! I need to get my average red day down. I want to stop out of trades once proven wrong, instead of waiting for max oh crap stop outs. My measurement to see if I am succeeding at these two goals will be a reduction in my average red day. This month I had an average red day of $1,750. My goal for December is $1000 or less. I had two bad loss days this month that were larger then they should have been. In both cases my lack of discipline on goal #2 played a role on the loss being bigger then it should have been. 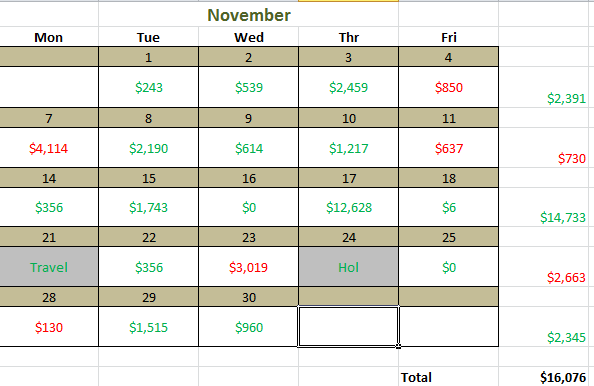 On both days I had a trade I was up on, but that never hit my profit targets. Instead of taking the trades off for breakeven when they bounced back to my entry, or locking in profits when they held support levels, I got stubborn and held, wanting to close green on the trade since I was just green, or insisting on hitting my profit targets. In both cases I had to stop out at my max stop loss of +/-$1000. I am seeing that there is a delicate balance on when to take profits and when to hold for more downside. I am looking forward to December and I am excited to continue working on my two goals. Wow! Congrats! I read your story and we have similar time frames and same people who influenced us, Tim and Nate. Only that I made some money in the beginning and have lost all in the past 6 months while my savings are draining. Wish I had your success! Great job! Thanks for the comment! Don’t give up!! I started out losing a big chunk coming close to blowing up my account due to stubbornness and I’m still digging out of that hole. It looks like I’ll get out by the end of the year, but it has been a lot of hard work. 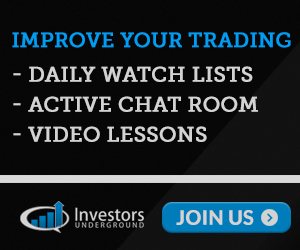 There have been days when I questioned my resolve to be a day trader, but I know that if I am willing to make the sacrifices now and constant incremental changes that I can get there and you can too!